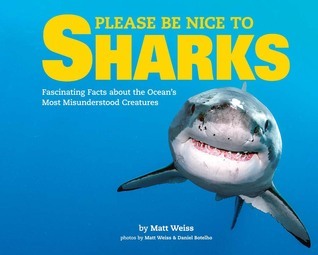 On the blog today I have a special interview with photographer, filmmaker, and journalist Matt Weiss who has created a book about sharks to help kids see what misunderstood creatures they are. Meet 14 cool sharks (and one manta ray) and see why it's important to BE NICE TO SHARKS! Though they’re often portrayed as vicious man-eaters, sharks actually kill fewer than 10 people per year. Yet those myths cause real harm: many species are being hunted to extinction, with as many as 100-200 million sharks being killed each year. This humorous book humanizes the incredible shark through breathtaking, original, underwater photography along with incredible facts about these amazing creatures in the wild—sending kids a crucial message about conservation in an irresistible format. In reading your author bio, you have written and photographed for many well-known publications. What made you want to create a children's book about sharks? As an underwater photographer, I saw a problem first hand: a precipitous decrease in shark populations around the world, with certain species declining by as much as 89 percent in less than 20 years. I wanted to find a solution that was in line with my company, DivePhotoGuide’s, mission: tell stories that have an impact on people through images and words. “Please Be Nice to Sharks” is my way of making a small contribution to the cause of saving sharks. Your book discusses why we shouldn't see sharks as a threat people because shark attacks are often the result of confusion in thinking the human was something else, like a seal for instance. As much as you love sharks, have you ever had a close call with one? Conversely, what's your best shark-related memory? During the summer, about 20 miles off a small Mexican island called Isla Mujeres, whale sharks aggregate by the hundreds to feast on tuna eggs. Whale sharks are massive sharks, some of them in Isla Mujeres are 40 feet long, but they are gentle giants. The first time I hopped in the water during their aggregation and was surrounded by about 15 of these sharks, some just inches from me, was probably my favorite underwater experience. What other animals do you like to photograph? As much as I like big animals, I’m an equally big fan of really tiny ocean animals. Hidden in the nooks and crannies of coral reefs are tiny fish and invertebrates that are incredibly interesting. Perhaps my favorite is a peacock mantis shrimp, which is only a few inches long, but can smash its prey with the force of a .45 caliber gun! They are also spectacularly colorful (hence their name) and make wonderful photography subjects. Since my blog is about food, books, and travel, I always end my author interviews by asking what's your favorite food, book, and place you've ever traveled? When I travel I love to try the local street food. Probably my favorite food experience is to sit outside on a street called Jalan Alor in Kuala Lumpur, Malaysia and eat charcoal grilled chicken satay. My favorite book is Last Chance to See by Douglas Adams, which helped me understand the importance of wildlife conservation (although since this is partially a food blog, Blood, Bones & Butter: The Inadvertent Education of a Reluctant Chef by Gabrielle Hamilton is right up there). And easily my favorite place I’ve ever traveled is Antarctica. Thanks Matt! You have certainly led a fascinating life of travel and a commitment to conservation.